David Powers King: IWSG and A to Z Challenge Reflections, The Future of The Cosmic Laire, and The New Trailer for Remake! IWSG and A to Z Challenge Reflections, The Future of The Cosmic Laire, and The New Trailer for Remake! Welcome back! So much has gone on that I'm having a difficult time pinpointing where to start. Good thing it's Insecure Writer's Support Group day, brought to you by the brainchild of this group, Alex J. Cavanaugh. I'll get to what's been making me insecure later. There's something I'd like to say about last month's A to Z Challenge first. A few things occurred that kept me from participating in the challenge more than I could. 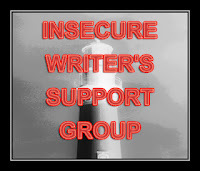 Even so, I visited a lot of new blogs, made some new connections, got new members, and spread the word for my novel in a way that didn't come off as a constant promotion. Some of you said something to that extent in the comments of my Z post. In truth, I just wanted to share in any way I could, and I thank Al Diaz again for making it happen. It's only fitting to officially end the challenge by giving Tina Downey's family a free copy of Woven. It's in the mail. Congratulations to all who joined in the challenge. You deserve it! Now to the Insecurities: I won't lie. April was rough. The A to Z Challenge was amazing, and I literally had some Woven or author related event every weekend, but I took more emotional and financial hits than I was prepared to take. But more than that, I hopped on the keyboard this morning to blog and realized, I'm not sure what I'm doing with this blog. And you would be surprised by how many ARC review requests I've received in the last month. Due to time, I turned down most of them. I'm facing the reality of being a published author, which, from my perspective, is far different than what I imagined as a teen. So long as it doesn't interfere with my work and family, writing has to take priority, meaning I must cut things so I have more time. To see how it works, I'm cutting back on blogging--maybe two posts a month. I'd rather have something of quality for you than something thrown together to reach a quota. Something engaging to readers and writers than reviews, of which I am only doing blurbs for books now. Maybe then I'll know exactly what I want to do with this blog. I'm in a period of transition. I thank you for your ongoing support. Are transitions rough for you? What have you done to get over that slump? Did you participate in last month's A to Z Challenge? I'm David, and this trailer for Ilima Todd's Remake is amazing! And thanks for sharing my trailer! Deciding how much time to spend on your blog, or social media, instead of writing your book is always a dilemma. And I'm pretty selective with the arcs I review these days, too. I've gotten myself in way over my head sometimes with those, and get frustrated when I don't have time to write. You'll figure out what's best for you. Again, congrats on the book. Two blog posts a month would be OK. That's more than I do. :-) I actually post once a month at my main blog because I don't go online often. I wish you the best of luck with your writing goals for this month, David! Welcome to the wonderful world of HOW DO I BEST SPEND MY TIME IN ORDER TO BE PRODUCTIVE, PROMOTE MY BOOKS WITHOUT BEING OBNOXIOUS, AND TOTALLY NOT GO CRAZY?! I'm still working on it ... but basically, I try to blog twice a week, but if I don't have anything to say, I skip. I visit other people's blogs when I have the time and when their post is interesting. I no longer review books (except occasionally for a critique partner). I've had to turn down some requests to read and blurb somebody else's book. And whenever I have the chance to interact with readers, I take it. This week, that means free Skype visits to schools in Michigan and Kansas. Totally, totally, totally the best part of my week -- and motivation to get write back to work writing the next book! Nothing psyches you up more than talking to the readers! Al did an awesome job with all of the illustrations. Now you know why I only blog once a week during the rest of the year. It's overwhelming otherwise. You have to make it all balance for you and your family. Nothing like the A to Z Challenge to make one want to cut back on blogging LOL. You have to be ancient and retired to blog as much as I do without any real strain. Glad you made it through though David. Al did a great job in support and I am sure Tina's family will appreciate everything you did including a copy of Woven. Way to go Sir David. I think it's better to cut back on posts and give quality content if that's what you feel needs to be done. Oh, I'm going to miss your posts. But real life stuff must come first, and especially all your published author duties :). Good luck with everything. I couldn't do A-Z this year. It would have killed me. But I am happy to say I am back on the book review train as of today and have been doing mini movie reviews on Facebook. Transition is tough and I wish you all the best. Right now I am realizing that I am having more joy out of my freelance work than writing for myself to be published. Sounds like a bummer but I am actually happy to help others create their own stories. You had to put a lump in my throat being all chivalric with Tina's family. I love you David. Keep being you and quality trumps quota every time. Cutting back to what you can manage is a good plan. I remember years ago meeting a writer at a book festival whose first book was one year from publication with one of the big five. She was so afraid it would change her life and take time away from her family. I gently told her that yes, it would change her life - prepare. Her book came out, she was sent on a huge tour, and less than a year later she closed her website and changed her email, saying she just couldn't handle it anymore. Don't let it overwhelm you, David. This is what you dreamed of - embrace it and keep a grip on what is important in your life. Transitions can be difficult, and you have my sympathy on the rough financial aspects, believe me. Write here what you can, when you can, and it's enough for me. You do have to take care of you. And a blog only needs a new post once in a while. Transitions are hard, but when you look back on this time, you'll see that it was all worth it. Sorry about you having a rough month, we all go through that at some point, You have made some new friends as well as you following new ones, that must be a good thing, You did a wonderful challenge and look forward to reading more post from you in the future albiet two monthly, It's your decision but if that is comfortable with you then that;s all that matters. Good luck. I did the A to Z challenge for two years, and while they were very rewarding experiences, I remember coming away from them feeling a little burnt out. I blog infrequently and I'm fine with others who do that too. Good luck with the transition. Transitions can indeed be hard, but the fruit that comes from them can also be quite sweet. ALL the best, Sir. You are well on your way! There isn't time to do everything. Being published does require different things than when you're working toward it. Hope to see you around. Decisions about our time become so crucial at a certain point in life. You are early, I would say, but that's good. I think you have your priorities right. Do what you have to do. The important thing is that you feel okay with yourself. A dragon hug. The more I live the more I think that everything is a transition. You must maintain your priorities and family and finances have to come first. I think we've both learned that trying to wear a cape can choke the life out of us. Do what you can, as you can and enjoy your success. You've earned it! It's a tricky balance. You need to do what works for you. I ordered your book for my boys for their birthday. I loved all the artwork you shared. I'll show them your site when they start reading the book. Well done, David! They say 'do what you love, and you never work a day in your life'. Figuring out how to get there is the real challenge, and you're there. As long as you're happy, that's what matters. It's great you've sent a copy of Woven to Tina's family .. that's wonderful and so thoughtful. Writing and everything that goes with it is a huge commitment. It can be difficult trying to figure out priorities. Wishing you much success. Take it at your own pace. I love reading about your publishing journey when you get the time. You have to do what's best for your writing! If that means less blogging, then that's what you have to do. Wishing you the best of luck and hope you catch up with everything soon! That's really tough. A dilemma. I hope you find it in your heart what you really need and should do. You did great on the challenge though. I've known numerous characters following your posts. There's always an ebb and flow to blogging if you've done it long enough. Often, stepping back helps reinvigorate the creative blogging energy. Plus, you've got a book to promote!